2015 was a big year at BRCK, transitioning from designing, engineering and manufacturing a product to creating services that use the BRCK as an enabling device. The team itself grew from 9 people at the beginning of the year to the 40 people we have on staff today, and we expanded our offices (still in the iHub building) so we could finally fit everyone into a room. While the raising of the $3m capital is what this is about, it’s not the most important thing. Capital is a tool that helps us keep up our growth momentum so that the products and services we build can scale beyond what we could do organically alone. As I have learned, there are a few more complexities and more expenses when doing hardware, rather than just the software company background that I was used to. Over the last couple years we have been privileged to have some truly amazing investment partners and that has only continued with this most recent round of capital injection. Steve and Jean Case were in our first round of investment, and after they visited Nairobi with President Obama in the summer of this year, they decided to reinvest. The same happened with our partners out of the UK, Synergy Energy. New investors are made up of some truly fantastic people that have a world of experience and connections in the worlds that we work in. For example, Jim Sorenson’s experience in building companies that scale, TED’s network and influence, MKS Alternative Investments brings us some fantastic manufacturing and network out of Europe and JP-IK has a world of experience in EdTech. We are truly honored to be working with them and appreciate their faith in us in growing BRCK. The BRCK company will use these additional funds as we scale up production and distribution for BRCK Education products and services, and as we continue to build out the next generation of products for the company. There will be additional hires, primarily on the product teams (hardware/software), but also on the operations and business teams as we move forward. We’re looking for the best that Kenya has to offer. Nairobi, Kenya, 6 January, 2016: BRCK Inc, one of Africa’s most innovative startups, today announced that it has closed a Ksh 300 million (USD 3 million) funding round. This significant capital raise included investment from former AOL executives Jean and Steve Case, along with other participating international investors including Jim Sorenson, TED, MKS Alternative Investments, Synergy Energy and others. This amount is additional to the previous USD 1.2 million the company raised through seed funding last year. BRCK Ltd., founded in 2013, created the BRCK – a device seeking to solve problems of electricity and internet connections in low-infrastructure environments. Physically tough in design with smart technology and enough backup power to survive a blackout for 8-hours, the BRCK can provide failsafe internet connectivity in almost any situation. Since the initial funding, BRCK Ltd. has evolved to sell the product in 54 countries across 5 continents and has also begun to revolutionise the Kenyan primary education system through the launch of BRCK Education with its flagship products, the Kio tablet and the Kio Kit – a digital classroom in a box. The new capital of USD 3 million will help expand the company’s operations, its ability to manufacture additional inventory, new designs of the devices and distribution across the continent and globally. 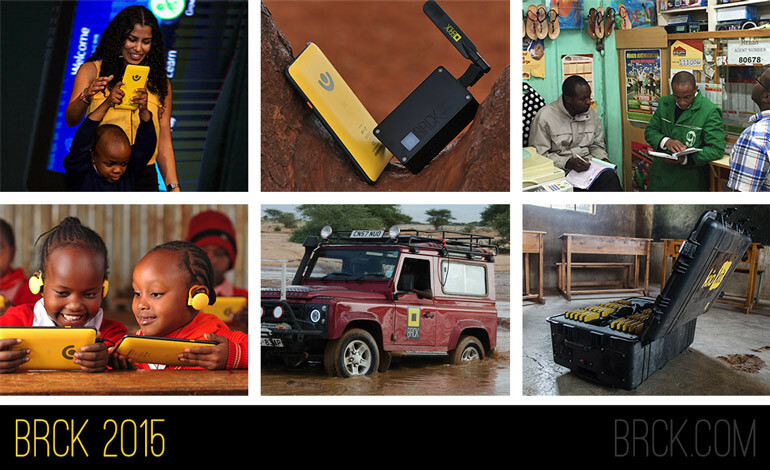 BRCK is a hardware and services tech company based in Nairobi, Kenya. As the first company to pursue ground up design and engineering of consumer electronics in East Africa, it has developed a connectivity device also known as BRCK, which is designed to work in harsh environment where electricity is intermittent. BRCK can support up to 40 devices, has an 8-hour battery life when the power is out, and can jump from Ethernet, to WiFi, to 3G seamlessly. The initial BRCK units started shipping in July of 2014 and by February of 2015, thousands of BRCK’s had been sold to 54 countries around the world. BRCK is a spin-off from the world acclaimed Ushahidi, a Kenyan technology company which builds open source software tools and which has received accolades for the impact that its creative and cutting-edge solutions are having around the world. In August 2015, BRCK signed a Memorandum of Understanding with Kenyatta University that covers joint collaboration in the design and development of innovative technological solutions, research, advocacy and stakeholder engagements, content development and training and capacity building. Through the partnership, the two institutions will roll -out cutting edge digital solutions that will transform the way education is delivered.